Playing the guitar is a huge goal for so many people, but it’s an intimidating hobby to take on. There’s so much to learn, even just about the guitar in general. With all the chords, strings, special names, etc. how are you supposed to get a grasp on all this stuff? 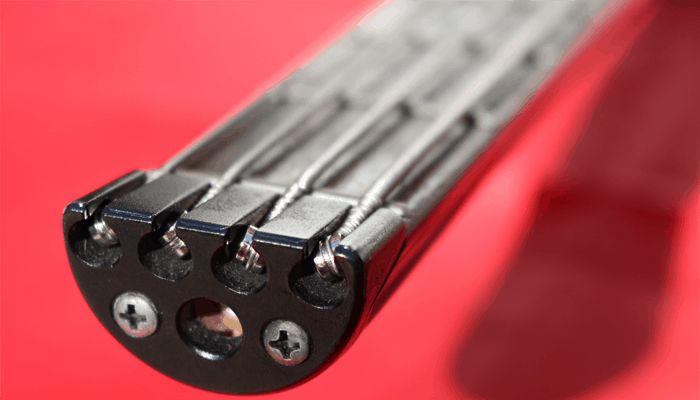 Paired with the different guitar brands and types of guitars, it can be overwhelming. As musicians ourselves, we knew there had to be a way to make new guitar players a little bit more comfortable with the selection process. After all, you’re in a foreign area of life with this stuff, right? All musicians have been there, which is why we want to make it a little bit easier on you. 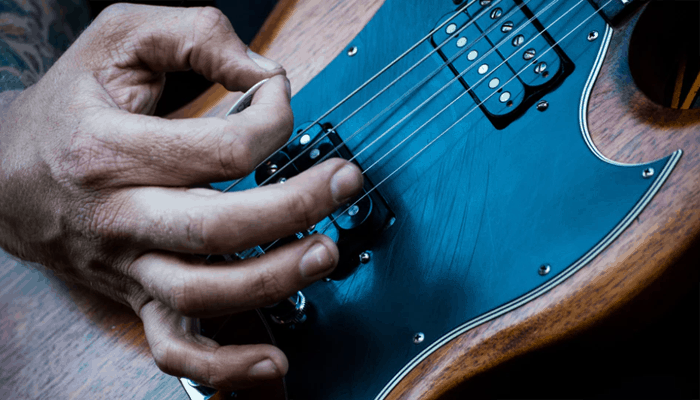 Instead of leaving you with just the names of good brands and styles, we decided to find the top 10 best beginner guitars to narrow down the selection and help you find the best guitar for you. Some people prefer certain electric or acoustic brands, some prefer others. Some people prefer certain body styles… You get the point. 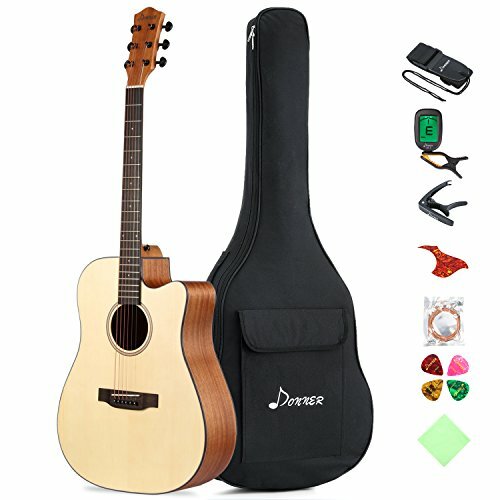 What kind of guitar should I buy for a beginner? How much does a beginner guitar cost? 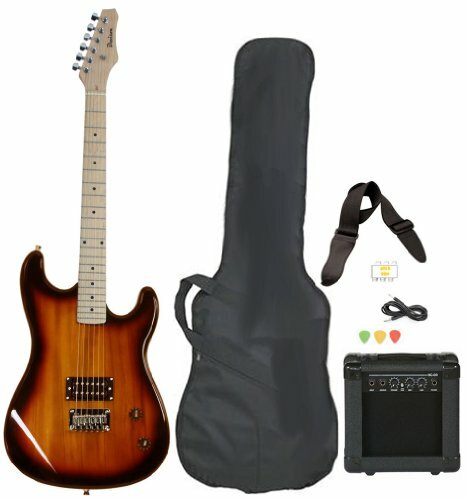 What is the best beginner electric guitar package? We searched all over the internet, through blogs, reviews, and so on to find the best beginner guitars for you. Instead of throwing a dart in the dark, we wanted to give you a better set of options. Why? Because music is a beautiful art, and the more musicians there are, the better place this world is! If you’re looking for the ultimate beginner guitar kit, then this is definitely worth checking out. The Fender FA-100 is a beautiful classic looking guitar with everything included to get you started on your musical journey. Instead of wasting extra money by buying it all separately, you can get everything in one bundle. Dreadnought acoustic guitars are the most sought-after style because they’re large enough to put off a deep yet high volume sound. Many other styles aren’t loud enough to play in front of an audience, but dreadnought guitars have always resonated in a non-obnoxious and very beautiful way. If you’re new to the guitar industry, then you probably don’t know the importance of wood choices. Getting the right wood on your guitar can really change the pitch, tune, and much more of the sound output. This laminated spruce top produces a beautiful rich tone while remaining incredibly durable thanks to the natural strength of spruce wood. Why We Liked It - We love any classic looking guitar that can hold its own like this Fender. It truly brings together the natural beauty of spruce with the generational efficiency of dreadnought guitars. If you see yourself as a future performer, then the Yamaha FG830 is a great option for you. It has the plug-in capability that allows you to connect it to an amplifier and get much louder. The FG830 doesn’t produce a horribly obnoxious sound like other brands that might cut corners when applying the amplifier capability, which is always nice! Again, the importance of choosing the right wood can’t be understated. Spruce is always a very common and reliable option due to its durability. Rosewood is an incredibly beautiful wood that also allows for a lot of pure, clean sound output from the body. The Yamaha FG830 allows you to choose from two different body styles: dreadnought and concert. Dreadnought is the largest style of guitar, and it produces much more volume at a deeper sound. Concert guitars are easier to handle while producing a slightly crisper sound than a dreadnought. The choice is up to you! Why We Liked It - We love plug-in acoustic guitars because they give the impression that you’re always ready to play in front of crowds. Even if you don’t want to now, it’s always nice to have the option later. The Donner DAG-1C is a perfect guitar for any musician looking for a larger model. At 41”, this dreadnought guitar is a beast! Due to the body size, it produces a beautifully resonating hum that’s sure to stick with your listeners for a long time. It’s also a great way to truly hear the sounds of your chords before hitting the stage. The kit included with the Donner DAG-1C is definitely worth mentioning. It has a capo, some strings, a carrying bag, some picks, a tuner, and more! It’s always nice to buy a guitar with a kit, because you’re going to have to buy the rest of it anyway. Save yourself some money and try to find a good bundle like this one. Cutaway style basically means that there’s a little dip in the top of the guitar. The main purpose of this dip isn’t for anything other than a nice appearance. It’s unique and breaks out of the ordinary. Why We Liked It - We enjoy sharing guitars of all sizes, because there’s nothing more upsetting than buying a new guitar just to find out that it’s too big or too small! For beginner musicians who want a smaller guitar, the Yamaha JR1 FG is worth looking at. It’s the ultimate start guitar kit because you get a perfect size guitar for any musicians paired with the ultimate all-inclusive beginner setup. Nothing is missing in the kit, and there’s actually a few surprises! While many guitars are starting to come with kits, it’s always nice to see one that comes with a little bit extra. This kit includes the normal stuff, like picks, strings, and a tuner, but there are also a few extra surprises. It has a capo to let you adjust the key you’re playing in and a peg winder. Peg winders make it a million times easier to tune your guitar and string it without manual labor. Meranti and spruce wood line this guitar’s back and sides to make an incredibly unique and beautiful mix. Meranti isn’t very common in modern day guitars, but it provides a beautiful head-turning appearance and unmatched sound output. 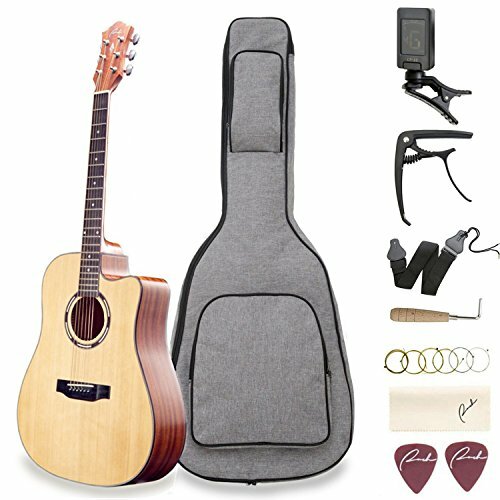 Why We Liked It - It’s not every day that we come across a beginner acoustic guitar bundle that includes a capo and a peg winder. When we saw this kit including the ¾ guitar style, we knew it was worth sharing. Electric guitars are a whole different animal than acoustic guitars. They’re vibrant, wild, and they carry audio in a much more metallic way. 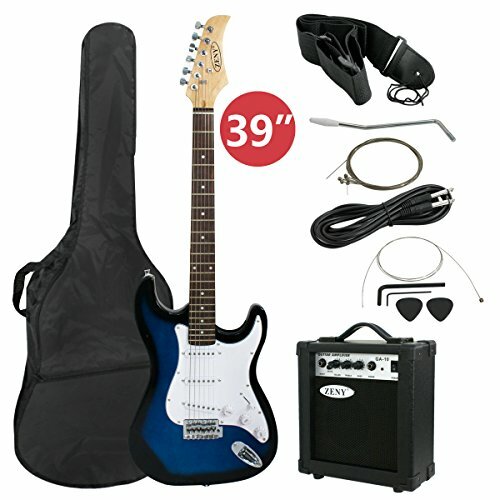 This ZENY 39” electric guitar is a perfect beginner guitar because it shows you the ropes of how they work, and it also includes a nice little starter bundle. The kit includes an amplifier, strings, a gig bag, some picks, and more. It’s everything you need to start practicing how to because of a legendary electric guitar player and learn all of your favorite songs! 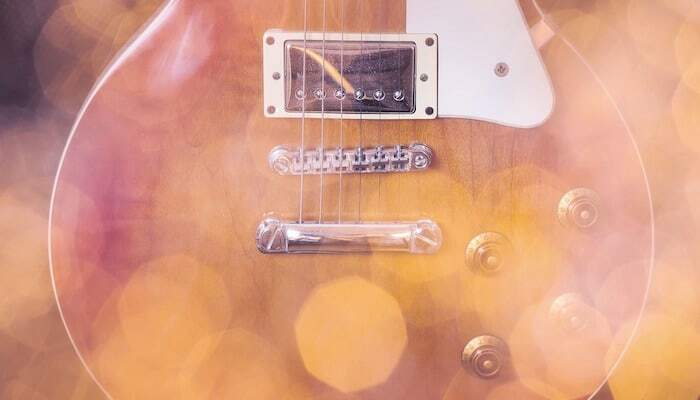 Electric guitars are all about style, appearance, and beautiful designs. 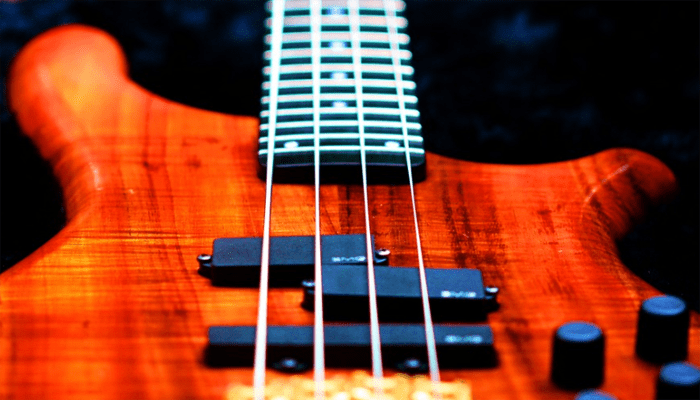 Each guitar is unique to the player, and thus the design is a huge part of your instrument. It’s almost like a guitar’s tattoo, so getting the right design is important. This one has a beautiful blue center with a darker royal blue exterior. Why We Liked It - Finding such a perfect beginner kit is rare. The low price point paired with the amazing design doesn’t hurt too much either! Remember how we said that an electric guitar’s design is important? Nothing says rocking out like an orange and yellow sunburst design! 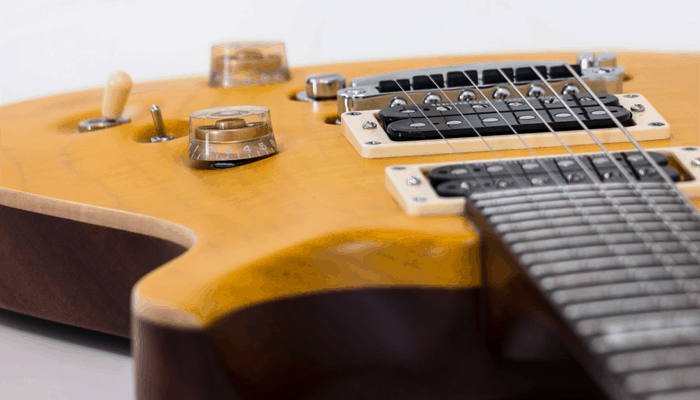 The Best Choice Products 41” Sunburst Electric Guitar is a beautiful instrument that’s definitely not too shy. Wow your friends and family with your performance after training with this beautiful guitar. 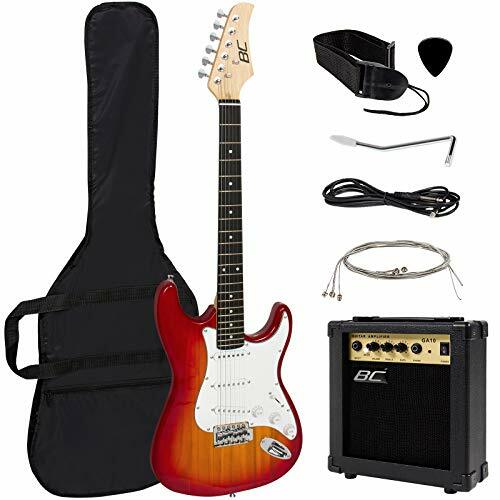 This beginner electric guitar kit includes everything you could ask for when starting out. It has a gig bag, an amplifier, some strings, some picks, and a guitar strap to hang around your shoulders while you play standing up. Nothing’s better than having everything you need right when you first start a new hobby! The hardwood body of this electric guitar shows in the size, and it’s sure beautiful! Laminated hardwood covered the entire instrument and boasts a classic yet modern appearance. It’s a great way to say that you don’t want to cause too much noise, unless it’s the right kind of noise! Why We Liked It - It’s hard not to like such a beautiful classic wood design like this electric guitar has. Matched with the beginner’s kit, it’s definitely deserving of its place on our top 10 list. The Ranch 41” Full Size Acoustic Guitar is a beautiful crafted, solid-wood beginner beauty. It’s an amazing choice for anyone breaking into the guitar world, since it pairs many different styles of woods and also includes a few bonus items in a bundle. The kit includes all the essentials and nothing that you don’t need. Sometimes having too many extra items can confuse you, so this kit is a perfect choice. It includes a tuner, a capo, some strings, some picks, and a couple of other small additions. 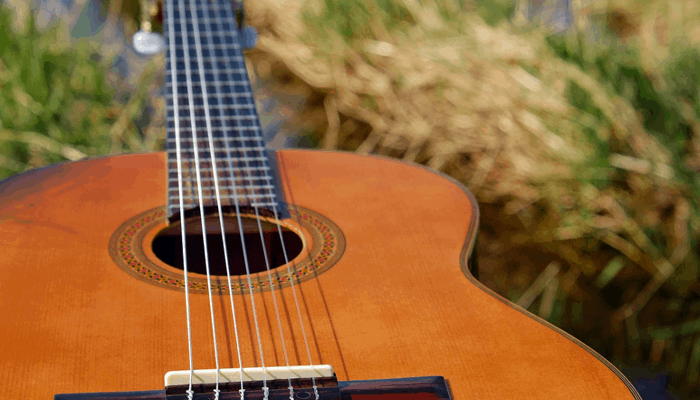 This acoustic guitar is a great selection for anyone looking at buying a larger instrument. It’s 41” long and a dreadnought body style. Dreadnoughts have a larger body that produces what many musicians feel is much better sound output. Why We Liked It - While so many competitors have the same old, same old appearance, this 41” dreadnought has many different types of rare woods that make it a true beauty to look at and listen to. Having a perfect beginner kit is always a great bonus as well! The Arcadia DL41TS is another great dreadnought acoustic guitar. With a length of 41”, it’s one of the longest and largest guitars on the market. Don’t let that scare you away from giving it a shot though. Many beginner guitar players enjoy using a larger guitar because all of the strings are further apart which makes them easier to pick. This unique guitar kit includes everything that most other kits do, with a few other surprises. You’ll get the picks, strings, and a gig bag. In addition, you’ll also get a guitar stand, an award-winning instructional DVD, and a few other supplies to get you started. This guitar is made with hand-carved mahogany on the neck and a spruce body. Spruce provides stability, durability, and beautiful tone. The fact that the neck is carved by hand just adds a little bit of a genuine appeal to the instrument. Why We Liked It - It’s hard to find a kit that includes everything you need with the addition of a guitar stand. Guitar stands are usually pretty expensive, so this bundle is a steal for any beginner guitar player. 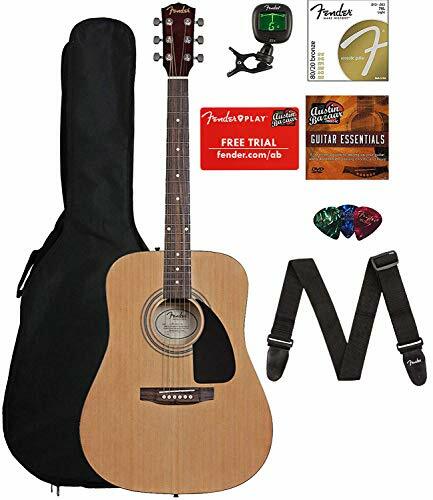 Another great beginner guitar package is the Jameson Guitars Starter Package. 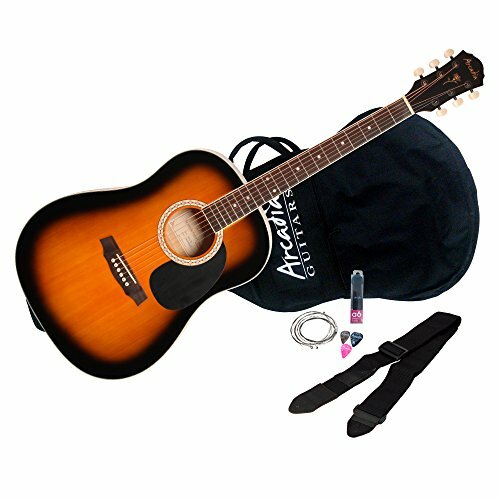 It features a beautiful electric guitar with all kinds of options and special items included in the kit. Sounds exciting? Read on! Some picks, a strap, a gig bag, and an amplifier come included with the purchase of this guitar. Although there’s nothing too crazy, it saves you a ton of money from having to buy these items separately. 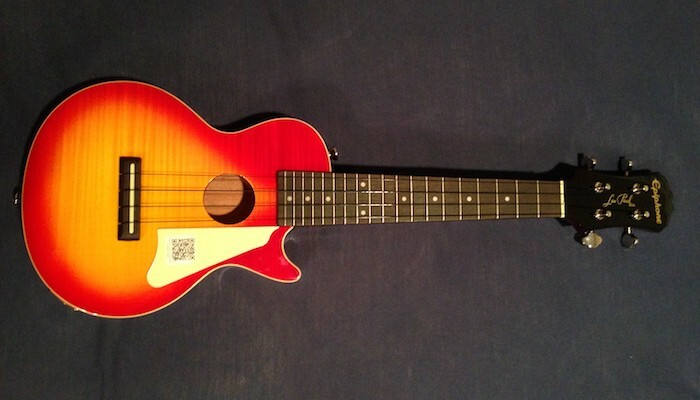 It saves you a bunch of money and gets you strumming as soon as you get the package. Now that you’ve seen the kit’s items, you’re probably wondering about the color variety. Currently, there are 4 different options that you can choose from including sunburst and pink. Instead of settling for whatever’s available, you get the selection to truly customize your experience. Why We Liked It - With all the different color options and items included in the kit, we felt that this was one of the best beginner guitar bundles to get you started with a decent setup. 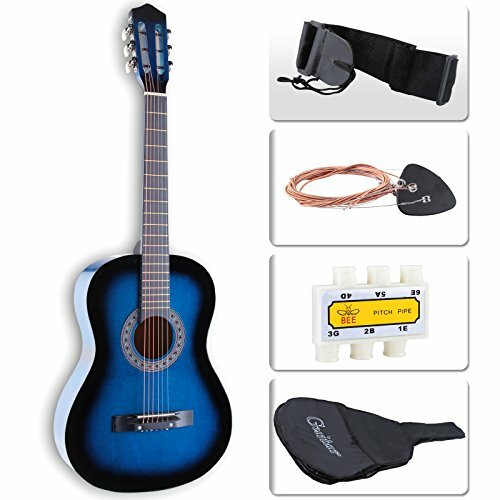 If you’re looking for an acoustic guitar bundle on a budget, the LAGRIMA Blue guitar kit is a great choice. 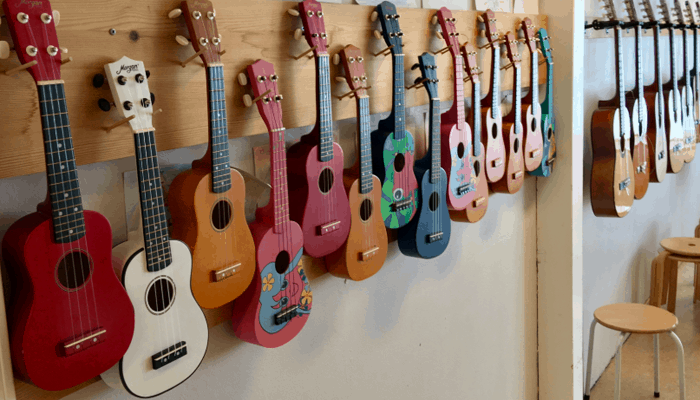 It includes all of the necessary beginner items and a training guitar to help you learn the ropes. 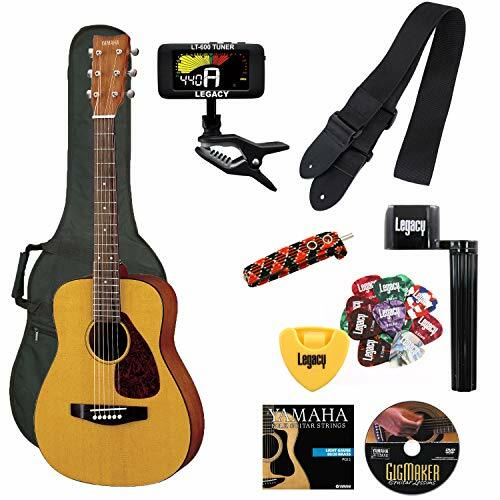 The kit included in the LAGRIMA Blue package comes with a strap, strings, picks, a pitch pipe, and a gig bag. 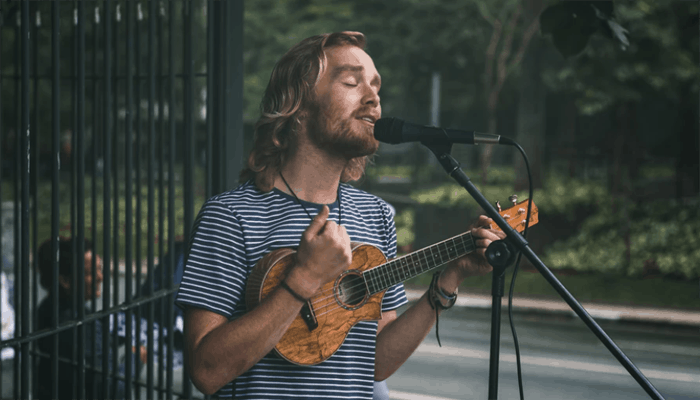 There’s nothing crazy in here, but it can also help declutter a little bit since you already have so much to learn with playing a new instrument. Sometimes having less in a kit makes it much easier on the musician. Due to the price point, the LAGRIMA Blue acoustic guitar package has seen itself as a #1 Best Seller on Amazon multiple times. It’s very easy to get started with this beginner guitar, without any knobs or special tuning required. Why We Liked It - Finding a decent guitar that’s also cheap usually presents too many problems. The guitar is either in terrible shape or it’s too expensive for the level of play. Luckily the LAGRIMA Blue didn’t have either of those issues! It really depends on which instrument you enjoy the most. 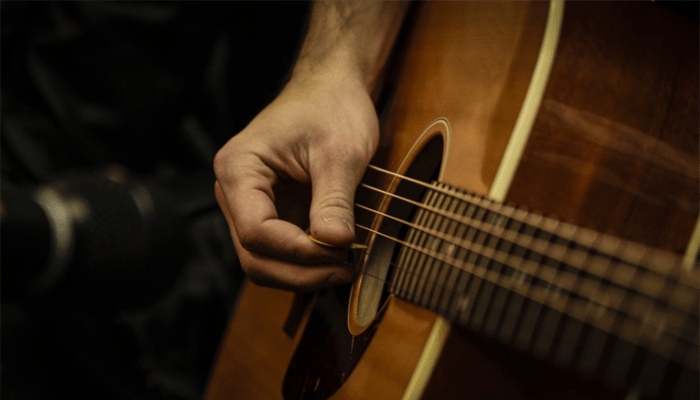 Electric guitars are great for people who enjoy rock music, whereas acoustic guitars are great for anyone who loves the low, rhythmic hum of folk music. Most people would say that acoustic guitar is easier to learn, and then move onto the electric guitar. You can always check out acoustic-electric guitars. The Jameson Guitars Starter Package is probably the best electric guitar for a beginner for a few reasons. It gives you everything you need to get started, and it also gives you a decent variety of color design options. Beginner guitar costs range from around $50.00 to $300.00 depending on the quality you’re looking for. Obviously the more you spend, the better quality you’ll get. However, you want to make sure that you do yourself a favor and buy a kit so you don’t have to buy everything else separately. The best beginner acoustic guitar has got to be the Arcadia DL41TS because it’s made of spruce and mahogany, the two most sought-after kinds of wood for acoustic guitars. It also includes a kit with all the beginner essentials. The best beginner electric guitar package has to be the Jameson Guitars Starter Package. Jameson is well-known in the music industry and provides excellent kits for beginners to get up to speed and playing excellent in no time. 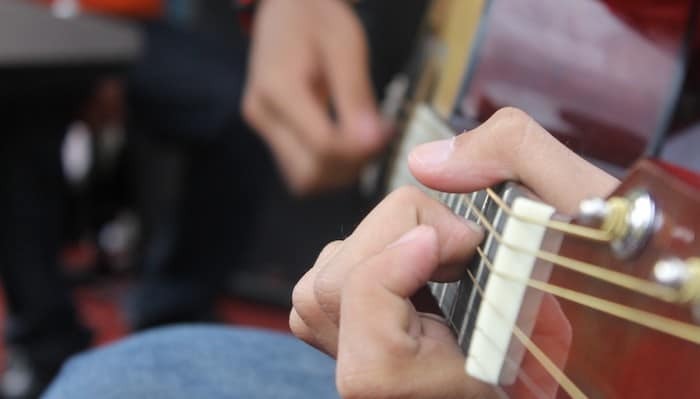 If you’re trying to find out which of the two types of guitar you should play first, try thinking about your favorite music style. Another great method is to think about your surroundings, and how often you’ll be able to play it. Some people can’t play electric guitar on an amplifier due to the loud volume it produces. Make sure you take these things into your thoughts when you decide which guitar you want to pick up first! Buying a guitar that comes with a kit can literally save you over $100! Picks, straps, guitar bags, all of these items add up to a hefty price. A guitar case can cost up to $75.00 alone! Do yourself a favor and buy a bundle if possible.